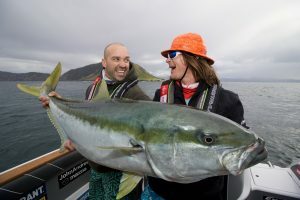 Big Angry Fish boat to feature a Simrad® electronics suite in Season 6 of the NZ television show. For the show’s upcoming sixth season, the Big Angry Fish boat has been refitted with a full suite of Simrad sportfishing electronics. The brainchild of New Zealand anglers Milan Radonich and Nikolaj Mathiesen, Big Angry Fish first aired on New Zealand’s TV3 in 2012. It has now run successfully for five seasons and also airs for Australian audiences on 7Mate. The Big Angry Fish boat is now equipped with a 16-inch NSS16 evo2 touchscreen multifunction display, 4G Broadband Radar™ system, BSM-3 Broadband Sounder with CHIRP, StructureScan 3D imaging, AP24 autopilot system with Simrad Precision-9 solid state compass, and RS12 VHF radio. The dual-channel BSM-3 sounder is fitted with twin Airmar transducers: a B175L-20 low frequency CHIRP transducer for maximum depth penetration, and a B175H-W high frequency/wide angle CHIRP transducer for detailed coverage at shallower depths. The B175H-W also offers the ability to quickly search large volumes of water, thanks to its extra-wide coverage. Adding the StructureScan 3D module and transducer means the Big Angry Fish crew will also have access to a game-changing new perspective beneath the water. StructureScan 3D provides a clear and immediately understandable 3D view that makes it easy to determine where fish and structure lie in relation to the boat. The 3D view can be adjusted with a fingertip on multifunction display; the crew can easily pan, tilt, and rotate to find the perfect angle. In choosing Simrad electronics, the Big Angry Fish team has ensured its boat is equipped with a comprehensive package of fish-finding, navigation, and safety technology. This package is backed by the solid service and support required to meet the high demands of television production in an unpredictable marine environment. To learn more about Big Angry Fish, visit the official website www.bigangryfish.tv. For more information about the Simrad technologies featured in this release or the complete range of Simrad marine electronics, please visit www.simrad-yachting.com.